Social media are computer-mediated tools that allow people to create, share or exchange information, ideas, and pictures/videos in virtual communities and networks. Social media is defined as "a group of Internet-based applications that build on the ideological and technological foundations of Web 2.0, and that allow the creation and exchange of user-generated content." Furthermore, social media depend on mobile and web-based technologies to create highly interactive platforms through which individuals and communities share, co-create, discuss, and modify user-generated content. They introduce substantial and pervasive changes to communication between businesses,organizations, communities, and individuals. These changes are the focus of the emerging field of technoself studies. Social media different from traditional or industrial media in many ways, including quality, reach, frequency, usability, immediacy and permanence. 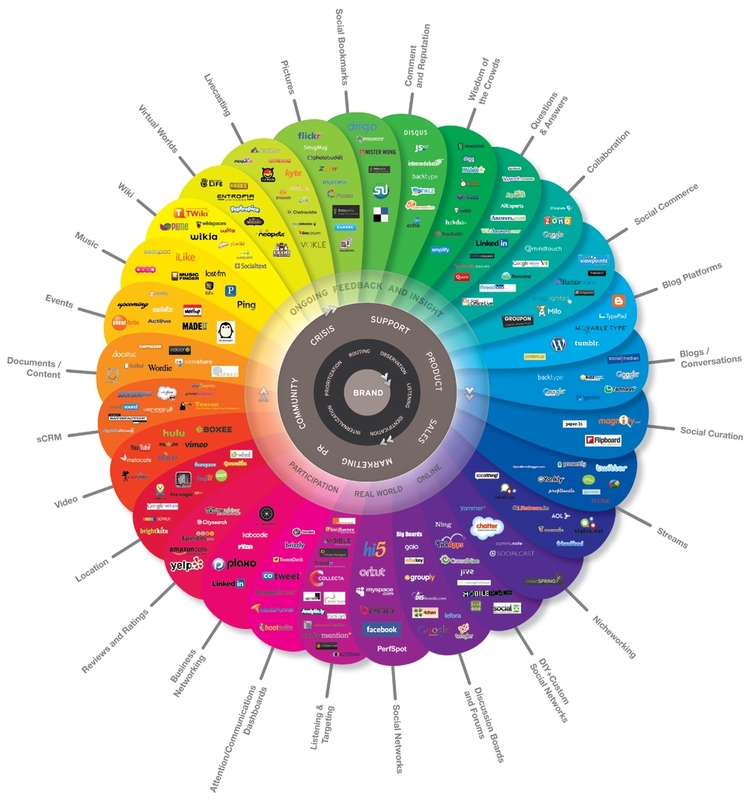 Social media operates in a dialogic transmission system, (many sources to many receivers). This is in contrast to traditional media that operates under a monologic transmission model (one source to many receivers). "Social media has been broadly defined to refer to 'the many relatively inexpensive and widely accessible electronic tools that enable anyone to publish and access information, collaborate on a common effort, or build relationships. There are many effects that stem from internet usage. According to Nielsen, internet users continue to spend more time with social media sites than any other type of site. At the same time, the total time spent on social media in the U.S. across PC and mobile devices increased by 99 percent to 121 billion minutes in July 2012 compared to 66 billion minutes in July 2011. For content contributors, the benefits of participating in social media have gone beyond simply social sharing to building reputation and bringing in career opportunities and monetary income, as discussed in Tang, Gu, and Whinston (2012). Some social media sites have greater virality - defined as a greater likelihood that users will reshare content posted (by another user) to their social network. Many social media sites provide specific functionality to help users reshare content - for example, Twitter's retweet button, Pinterest pin or Tumblr's reblog function. Businesses may have a particular interest in viral marketing; nonprofit organisations and activists may have similar interests in virality. Although traditional social media offer a variety of opportunities for companies in a wide range of business sectors, Economic Sector mobile social media makes use of the location- and time-sensitivity aspects of it in order to engage into marketing research, communication, sales promotions/discounts, and relationship development/loyalty programs. Marketing research: Mobile social media applications offer data about offline consumer movements at a level of detail heretofore limited to online companies. Any firm can now know the exact time at which a customer entered one of its outlets, as well as comments made during the visit. Communication: Mobile social media communication takes two forms, the first of which is company-to-consumer in which a company may establish a connection to a consumer based on its location and provide reviews about locations nearby. The second type of communication is user-generated content. For example, McDonald's offered $5 and $10 gift cards to 100 users randomly selected among those checking in at one of the restaurants. This promotion increased check-ins by 33% (from 2,146 to 2,865), resulted in over 50 articles and blog posts, and prompted several hundred thousand news feeds and Twitter messages. Sales promotions and discounts: Although in the past customers had to use printed coupons, mobile social media allows companies to tailor promotions to specific users at specific times. For example, when launching its California-Cancun service, Virgin America offered users who checked in through Loopt at one of three designated Border Grill taco trucks in San Francisco and Los Angeles between 11 am and 3 pm on August 31, 2010, two tacos for $1 and two flights to Mexico for the price of one. Relationship development and loyalty programs: In order to increase long-term relationships with customers, companies are able to create loyalty programs that allow customers who check-in regularly at a location to earn discounts or perks. For example, American Eagle Outfitters remunerates such customers with a tiered 10%, 15%, or 20% discount on their total purchase. E-Commerce: Mobile social media applications such as Amazon.com and Pinterest are influencing an upward trend in the popularity and accessibility of e-commerce, or online purchases.